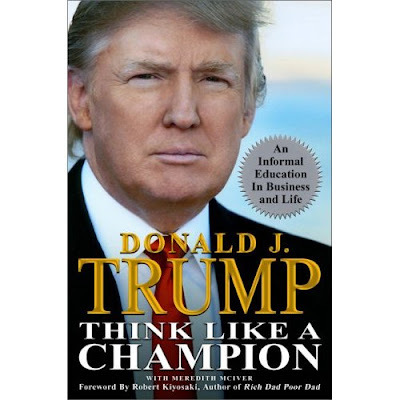 The book of the week was Think Like A Champion by Donald Trump. Good Book. Last night I went to see the new Wall Street movie. In the original movie Gordan Gekko makes the quote above in one of his speeches. Surprisingly, I don't completely disagree with Mr. Gekko. (This should create some amount of shock because Gordan Gekko is a tyrant, a manipulator, and a thief) I agree with him on two accounts though... Life and Knowledge. I don't agree with being greedy for money, but I think you are a fool if you aren't greedy- "having an insatiable desire"- for life and for knowledge. Say what you will about Donald Trump, but I think that he is greedy for both of these things. He has lived his life. He has had a tremendous amount of momentum in life to reach his personal goals. He has a thirst for life and knows exactly what he wants to do with it... and then does it. And while he conquers life, he also has an insatiable desire for knowledge. This book is a compilation of small essays written by Donald Trump about a myriad of different ideas. He writes about confronting fears, destiny, thinking positively, financial literacy, learning, and about 50 other ideas. Every essay is very well written and there is a tremendous amount of experience poured out onto the pages as well. Trump writes in one essay about a conversation he had with a group of people when a gentleman spoke up and mentioned how powerful the Trump name had become. Donald Trump replied, "What's in a name." The man just laughed and said "in your case, a lot." Trump noticed the guy was a little out of the loop so he said "That's Shakespeare. What's in a name is a famous line from Shakespeare." The man, still perplexed asked "From what?" Even though Trump knew that it was from Romeo and Juliet, he said "Look it up. You might learn some interesting things along the way." I love the story. It shows a couple things. It shows that Trump is about as brash as they come and it also shows that he clearly has a greed for knowledge. Ralph Waldo Emerson is famously quoted " Do not go where the path may lead, go instead where there is no path and leave a trail." I like this quote. Trump writes about how important it is that you don't just follow in someone else's path, but instead find your own path and your own purpose. There are two parts to being greedy for life. One finding your purpose and two keeping up your momentum. Donald Trump sets aside quiet time each morning to center himself and focus on his path. Many of the other Greats throughout history have other techniques including taking walks or taking naps in the middle of their day. Find what will help keep you on your path and use it. So is greed good? Yes. Greed focused on the right things is completely acceptable in my opinion. Find an insatiable thirst for knowledge and life and conquer the world, just like Mr. Trump. Make yourself a household name. I liked this book. Trump has been around the block and that block happens to be real estate, of which I am very interested, so it shouldn't be to unusual that I want to know what he knows. I do recommend this book. It's a fun read with lots of fun content. As always, if you have any questions on the book don't hesitate to ask. I would be more than happy to help anyone that wants it. 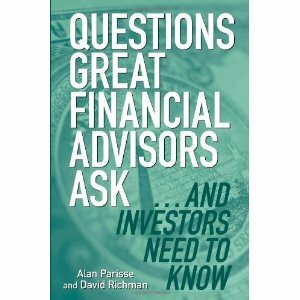 The book of the week was Questions Great Financial Advisors Ask by Alan Parisse and David Richman. I was not super excited by this book. In fact, I am not a huge fan of Financial Advisors to begin with. In the past, Financial Advisors used to be a great tool, but with the accessibility of information nowadays they just aren't all that necessary. The book was really for Financial Advisors and talked about all the ways to sell yourself in an effort to have a lifelong client. However, it doesn't hardly take any time at all to manage your own funds, so using a fee based advisor is crazy and using a advisor that takes a percentage is just taking away from your earnings. I don't have a lot to say this week. I don't encourage the use of a financial advisor... if you really need some advise on any investments I am more than willing to help. The only thing I want to say is this week is... diversify. A lot of Financial Advisors don't really understand the real idea of diversification. They will put your money in 10 different mutual funds, and those are a mix of lots of different stocks and bonds. What's wrong with this? Well... when it really comes down to it.. you are still investing in just stocks and bonds! It may be a 1000 different companies, but you only have two types of investments. To really diversify you need to invest in stocks, bonds, real estate, gold, silver, ETFs, personal businesses etc. If the stock market crashes, like it has a tendency to do, and you only have stocks and bonds you will end up losing your shirt. So diversify. This book was not riveting and would only be helpful if you are a Financial Advisor. I do not recommend this book for the casual reader. As always, if you have any questions on the book don't hesitate to ask. I would be more than happy to help anyone that wants it. 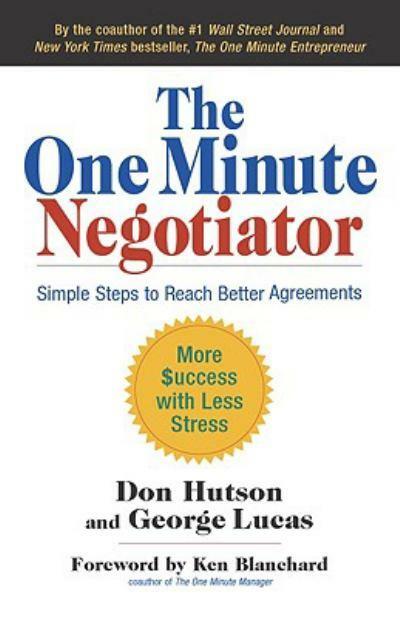 The book of the week was The One Minute Negotiator by Don Hutson and George Lucas. This was a very good book. I had a couple take-aways that I am excited to use in my daily leadership detail. The book is about taking simple steps to reaching a better agreement. When most people think about negotiating they think about big business deals and before I read this book that is what my first thought was when thinking about a negotiation. However, you don't need to be putting on your negotiation hat just for the big things in the business world. Any small conversation with someone within your organization can be a time to use what we know about negotiating. Let me take a little time and illustrate some of the main ideas from this particular book. 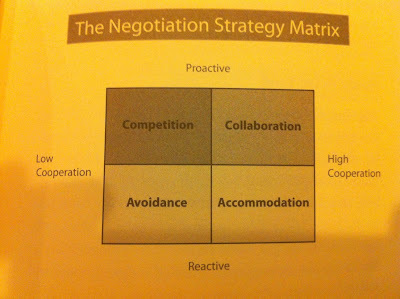 You can either have a proactive or reactive strategy while at the same time having low cooperation or high cooperation. 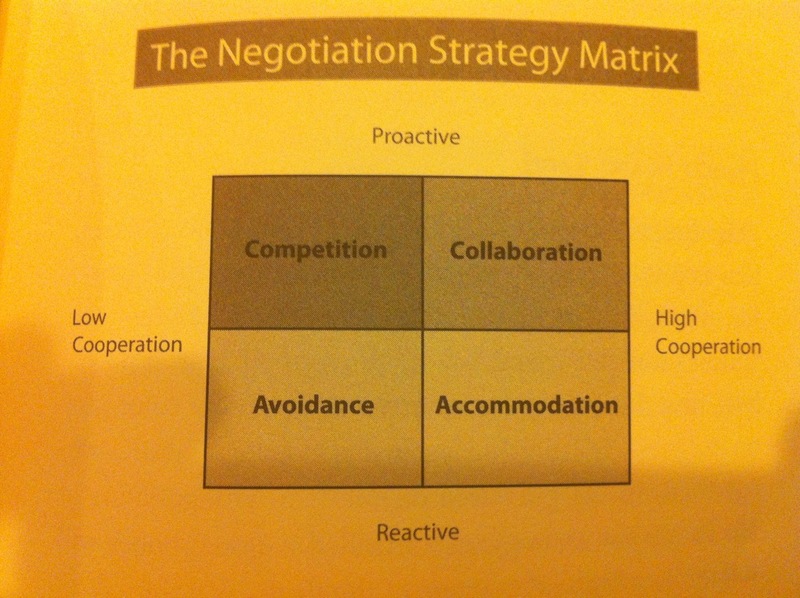 The ideal quadrant to operate within while negotiating is collaboration; this will result in a win-win. Any other quadrant will result in a win-lose situation for the most part. Again you can negotiate within any small conversation that you intend to reach an agreement. Generally, when people have what is perceived to them as a small conversation they will be reactive instead of proactive, so they either avoid the conversation, letting the other person make the decision without them involved or they will accommodate and give into whatever decision the other person wants. Being reactive can have devastating long-term consequences. And the other side you can be proactive in your negotiations. On one hand you can be collaborative and make your ideal win-win solution, however, if you are on the low end of cooperation you end up in the competition quadrant and you end up with a win-lose situation. But while the previous situations led to you being the loser, this situation leads you to be the winner and the other party being the loser. This still isn't ideal because you end up tearing down that relationship in the long-term. If you focus on this very simple negotiation strategy matrix you can effectively make better agreements and build up your long-term relationships. Ultimately, resulting in the strengthening of your personal leadership abilities and, additionally, achieving results within your organization. A little more about the book… it was just released a couple weeks ago. Inside the book is a quiz to analyze what quadrant you are most inclined to use on a regular basis. The quiz is a very effective tool in self-evaluating your subconscious negotiation technique. The authors also add an EASY process for negotiations… it stands for Engage, Assess, Strategize, and Your One Minute Drill. It’s a fun little tool to help you habitualize (it’s not a real word, but you get the idea) your negotiation strategy. Overall, very good book and simple read. I recommend it to everyone because not only is it something you can use in the business world, but since we now know that negotiations are not just intended for the business world, you can use the techniques from this book at home and have tremendous results. As always, if you have any questions on the book don't hesitate to ask. I would be more than happy to help anyone that wants it. Additional Content!!! In celebration of paying off my student loans this month I would like to share with you an Infographic I found about student loans.... Lots of great information!